Each government recognises that there is a potential loss of competitive advantage of its business sector if future economic growth strategies are not aligned with a low carbon future. Some multinational organizations recognise this imperative and the importance of aligning business activities to a more sophisticated and flexible environmental management system that also incorporates quality, safety, occupational health and corporate ethics. An organisation’s Environmental Management System (EMS) has, traditionally, been designed to address legislative and regulatory requirements. It has now become a measure of an organisations attitude to balancing environmental, economic, cultural and social needs of its trading communities. By using real world case studies this text positions EMS as a core and critical management tool and a key requirement for businesses long term survival. 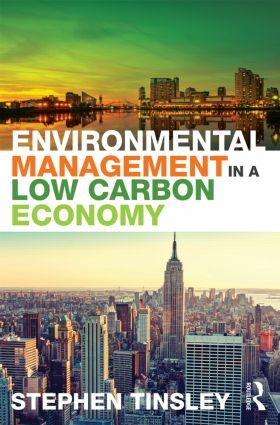 It provides fundamental building blocks to implement an environmental management system and clearly illustrates how it can be positioned within an organization to deliver innovative products and services to compete in a low carbon economy. Environmental Management in a Low Carbon Economy will prepare students and professionals alike with the ability and understanding to implement an environmental management system which in turn will aid organizations in facilitating their transition to operate in a low carbon economy.